Blue Valley Recreation Commission earned two state awards at the Kansas Recreation and Park Association (KRPA) Annual Conference in January. Staff member Nan Kanter received the Therapeutic Recreation & Aging Service Award for her work with Special Populations and Special Olympics, and the Employee Educational Scholarship Program was voted as the innovative program. Kanter found her calling in college as a special education major. After finding little opportunities for her own special needs son, she became a member of Blue Valley Rec's staff in 1988 as the Special Populations programmer and started the Blue Valley Blue Streaks – our local Special Olympics team. "Nan has a tremendous heart for service with special populations," said Steve Baysinger, Blue Valley Recreation executive director. "We are extremely proud of the work she does and the positive impact she has made and continues to make daily for so many families in our community." The post-secondary educational scholarship started in 2009 as a way to honor dedicated staff and volunteers. The scholarship is funded through a combination of voluntary contributions from employee payroll deductions, contributions from Commissioners, and various fundraising programs. 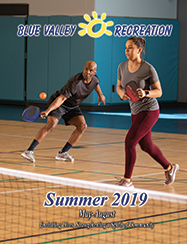 Applicants must submit a three-page application and must have been employed at Blue Valley Rec for a minimum of 80 hours or volunteered for at least 20 hours within the fiscal year (July-June). Scholarships are used for post-secondary education. "Blue Valley Recreation Commission's educational scholarship program is unique," commented Baysinger. We know the importance of volunteers and part-time staff in making our programs and events available to the community and are happy to reward the effort by advancing education."